Sisters that have overcome a lot despite their medical challenges. The sisters have overcome a lot despite their medical challenges. Hannah is very headstrong and has learned to do so much through the years. She has learned to walk and even ride a tricycle. “For someone to look at her they would believe it’s not possible,” said Shanna. Madison is very easy going and tends to take things in stride and endure whatever she has to. “Having the right people in our lives, including the Rainbows’ staff, has helped us get through a lot,” Shanna said. 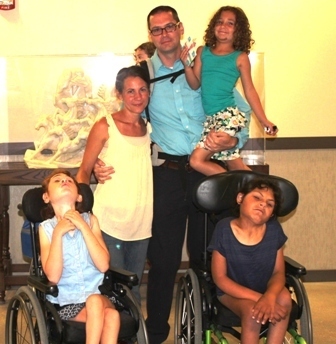 Rainbows’ Targeted Case Manager, Melissa, was able to get the family the needed waiver for respite care services very quickly when Hannah and Madison returned. “Our family is so thankful for Melissa’s persistence, because the respite care services are a huge relief,” Shanna said. Camp Woodchuck has also greatly impacted the girls and their mom. “The camp staff is very consistent and helpful for the girls, which allows me time to run errands and spend time with our two younger children during the summer,” said Shanna.